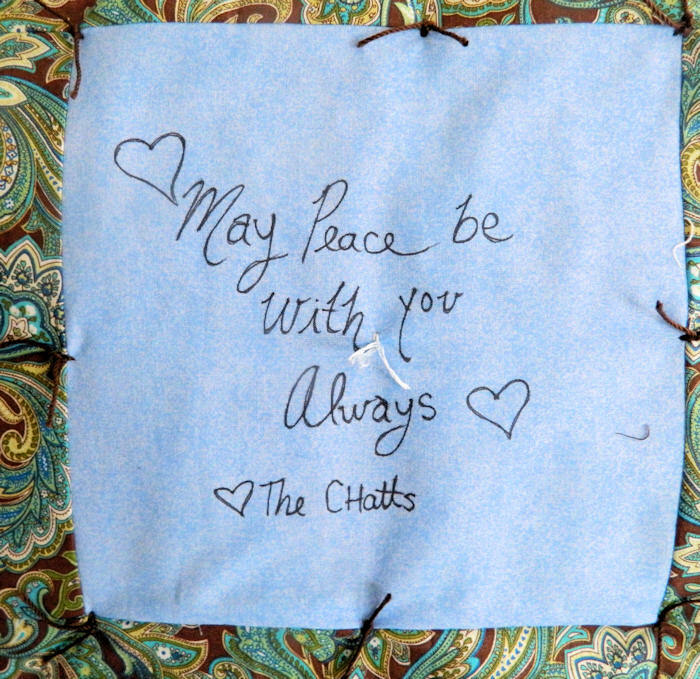 Author Catherine Castle, of The Writer’s Block, invited me to write an article about quilting in community for her blog. I shared about the Bridal Quilting Bees and the Baby Bees. Check it out! It’s up and it’s beautiful! Barn Quilts (technically they are Barn Quilt Blocks) are everywhere here in Wisconsin – people even make smaller versions for garages, sheds or even the sides of houses. We enjoy them. There’s something about a quilt on a barn that makes us feel comfortable. 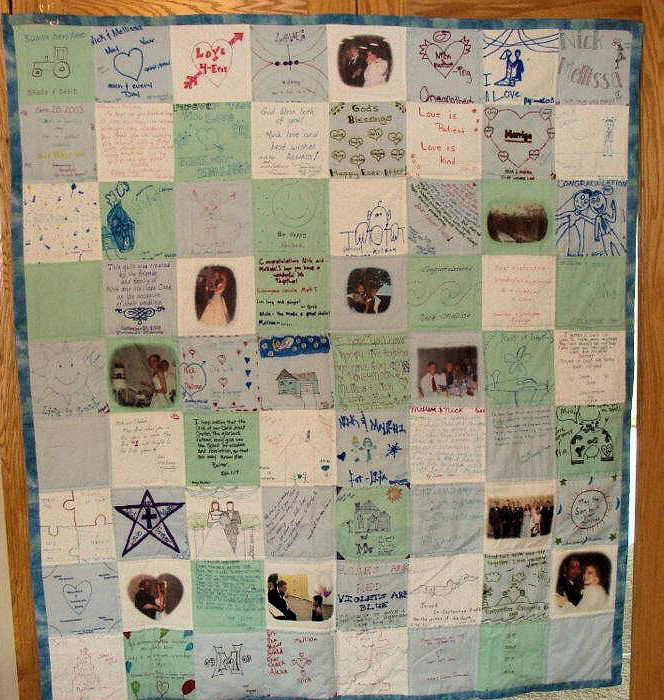 Barn Quilts in Wisconsin and throughout the Midwest are sometimes featured in “Barn Quilt Trails” maps, usually organized by county agencies, departments of tourism or local quilt guilds. 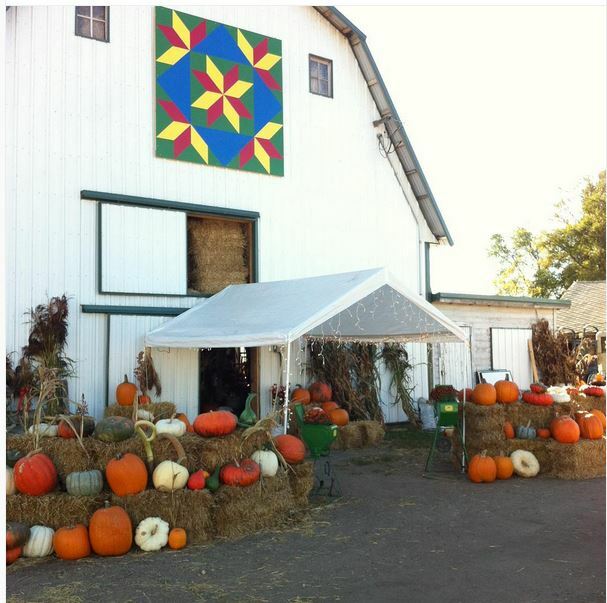 You can enjoy a day in the country, seeing all of the different quilt blocks! 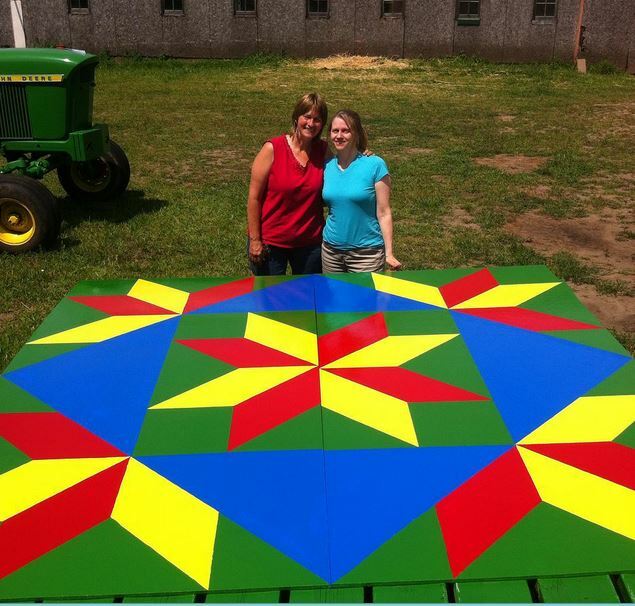 How to make a barn quilt: My sister Cory and I made this one with two 4’X8′ sheets of top quality plywood. We started with a few layers of primer and then drafted out the pattern, working on one board (half of the block) at a time. We used the same heavy-duty enamel paint that they use on their farm equipment, in John Deere Green, Ford Blue, IH Red, and Ford Yellow! Hauling those sheets of plywood in and out of the barn while we alternated so we could paint and let it dry between layers and edging was hard work! 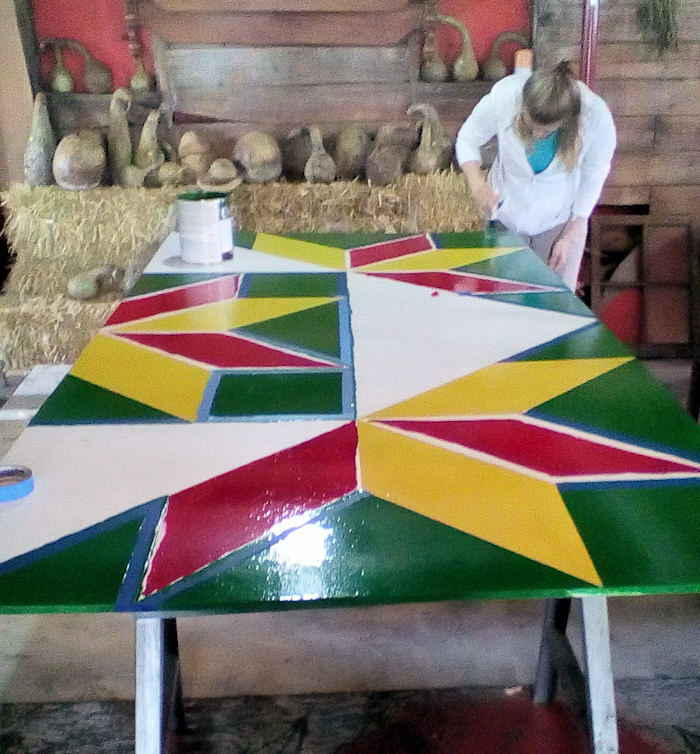 The pattern is called “Bright and Morning Star,” one of the names of Jesus Christ, to reflect the faith of the Pearson family farmers. 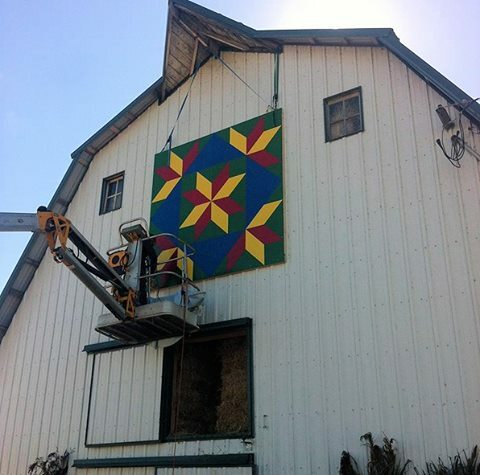 How to install a barn quilt: Leave town and let the farmer do it. I am related to some very resourceful men! My nephew and brother-in-law took care of this part of the project. They rented a lift for the day and had to drill through the (fairly new) siding and wall of the barn to mount the block securely. My sister and her husband farm in Ramsey, Minnesota, just north of Minneapolis, in an area that has become quite suburban since the farm was established three generations ago. It’s hard to farm in the city! 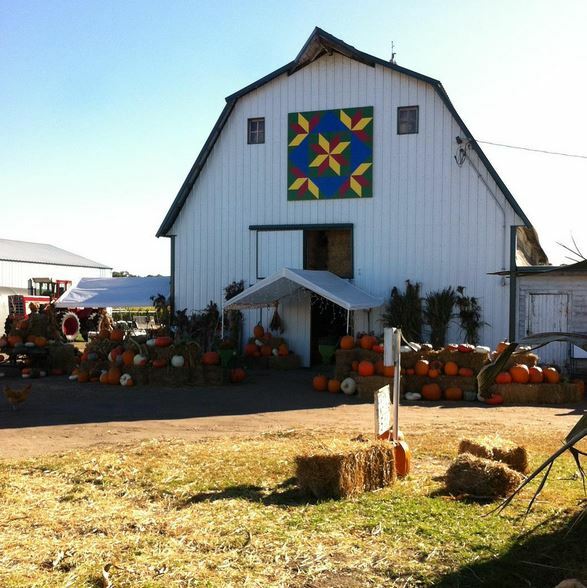 To supplement the income from “real” farming, they have diversified to include seasonal sales of pumpkins, straw bales, fall decor, popping corn and corn stalks, etc. They do hay wagon rides and have a small corn maze. They sometimes have special community events with live music and games for the kids. This “Fall Sales” season is short, but it’s a significant part of the farm’s income. 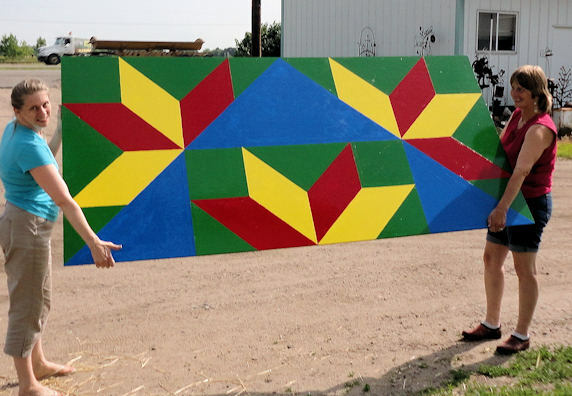 The quilt block, which is visible for a long distance along the major road that passes directly in front of their farm and also from the commuter train across from that, will be good promotional advertising for them. And we think it looks great! 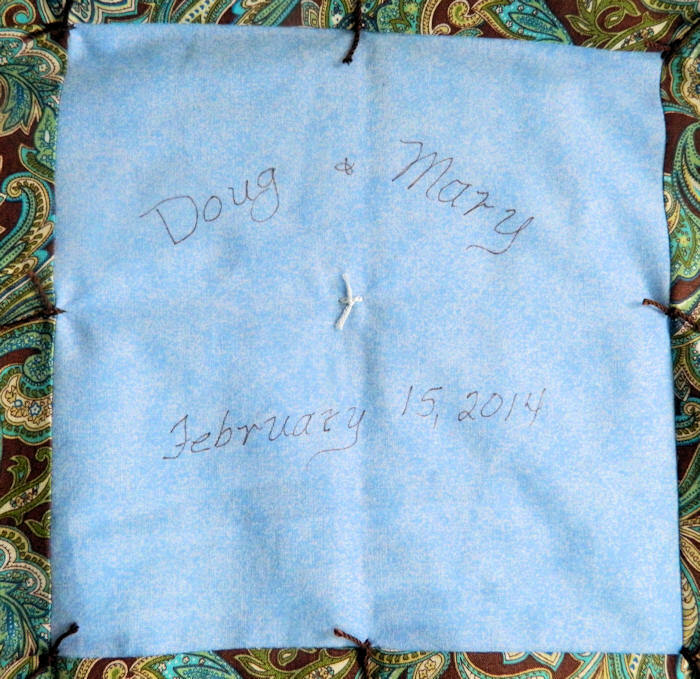 The Wedding Day Quilt – a soft and cuddly guest book? 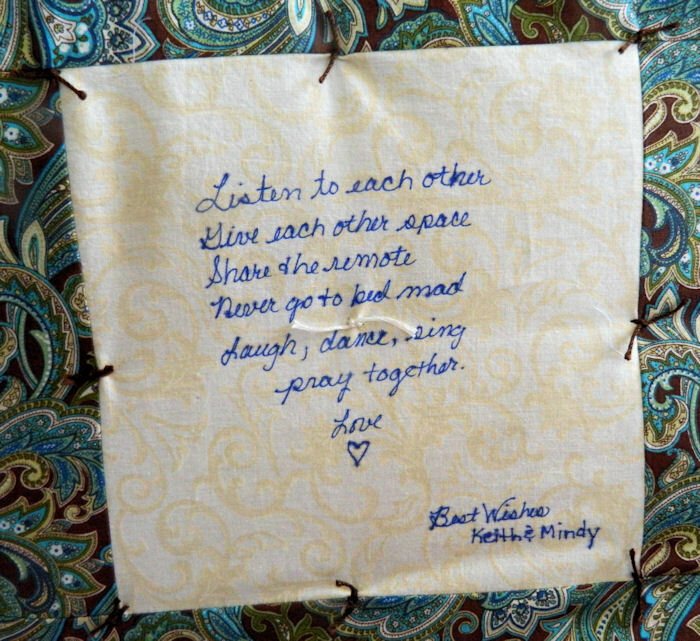 At the Bridal Quilting Bee, the bride’s family and friends create a beautiful queen-size quilt, destined to become a family heirloom. It’s an all-day fellowship event, a not-to-be-forgotten time of sharing. 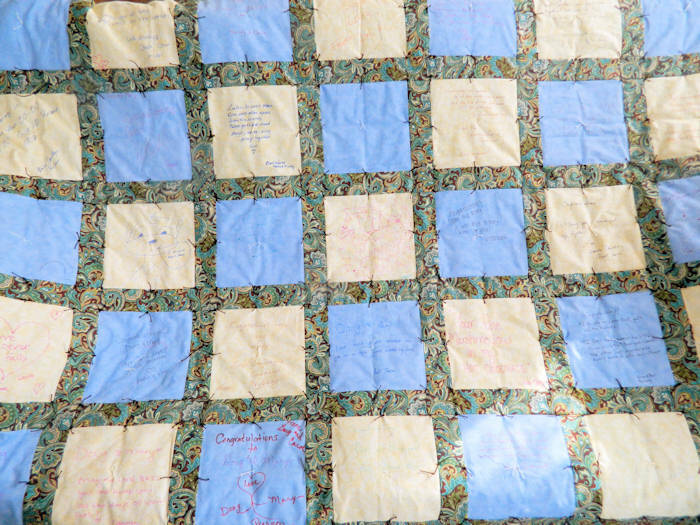 It’s a complex project, though; I organize and facilitate the Bee, selecting a pattern with the bride, drafting the pattern, coordinating with the hostess, planning the work flow… It’s more than just making a beautiful quilt! 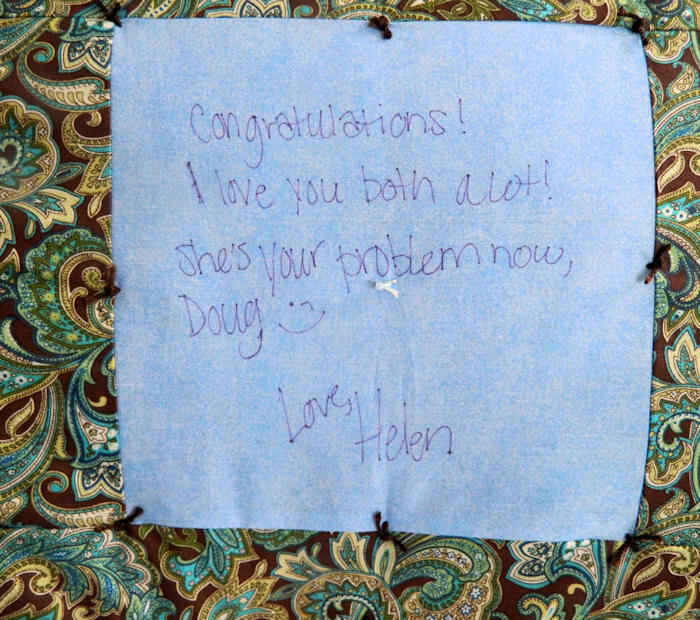 A Wedding Day Quilt is a simpler project, easily assembled by even a beginning quilter. The idea was conceived to fill that inevitable gap between the end of the wedding ceremony and the start of the official reception. This can occur because of a long receiving line, but usually it’s a time of taking photographs. The guests are sometimes left waiting for an hour or more, and this is the perfect time for this project. Just like your guests, the quilt blocks will all be different. Your college roommate, your crazy Uncle Joe, your little sister and your great grandmother will be able to express their good wishes in their own personal style! 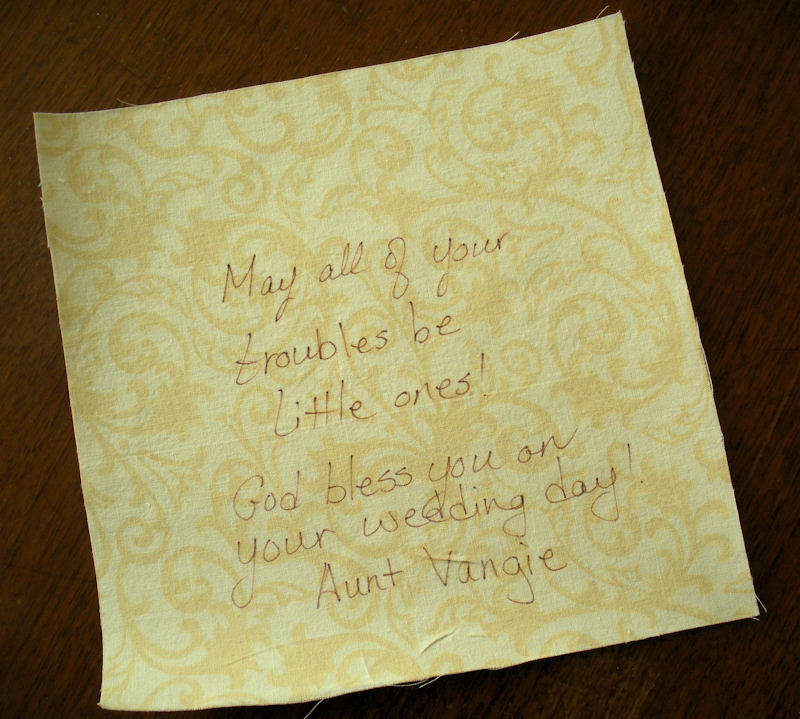 It’s a fun substitute for a traditional guest book – and less likely to be packed away forever after the wedding. 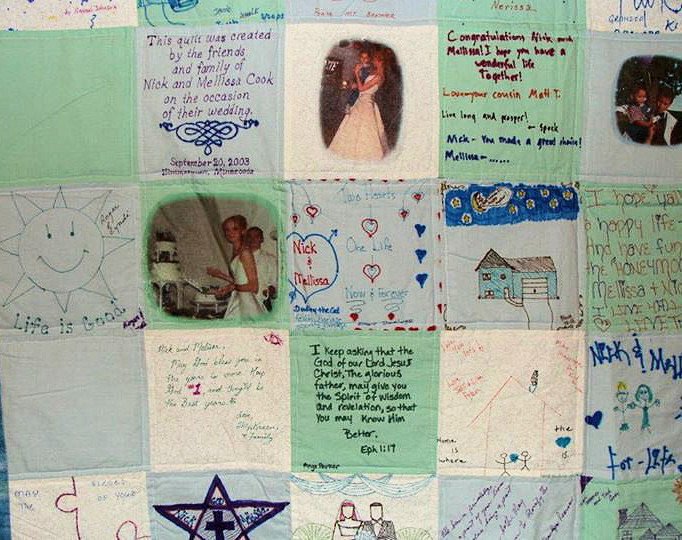 The size of the quilt will be determined by the number of participants, so it is sometimes best to buy the batting and backing after the quilt is assembled. The signature blocks should be light “solid prints” – single-color fabrics with only a faint pattern that does not distract from the writing. Launder and cut the fabric into squares ahead of time. 8″ squares are an efficient size; you will get 20 squares from one yard of fabric. Cut an equal number of 8″ squares of freezer paper. Iron the glossy side of the freezer paper to the wrong side of each of the fabric squares. This creates a stiff canvas for easier writing and drawing. Remove the paper by peeling it away before you sew the blocks together. You will need permanent fabric-marking pens, available with scrapbooking supplies. I like Sakura Micron Pigma pens, but I have to admit that the ultra-fine Sharpies have worn just fine over ten years of daily use and multiple washings. They are much less expensive and available in many colors, and the ink is “set” when you iron the blocks as you sew them together. Guests are more likely to participate if you keep it very simple. It would be most effective to set baskets of fabric squares and complete sets of colored pens at each table, but they don’t always coordinate well with expensive and elegant floral arrangements and table settings. Instead, set up a table at the entrance to the reception space with stacks of the fabric squares, plenty of pens, a sign explaining what you are doing and several samples. 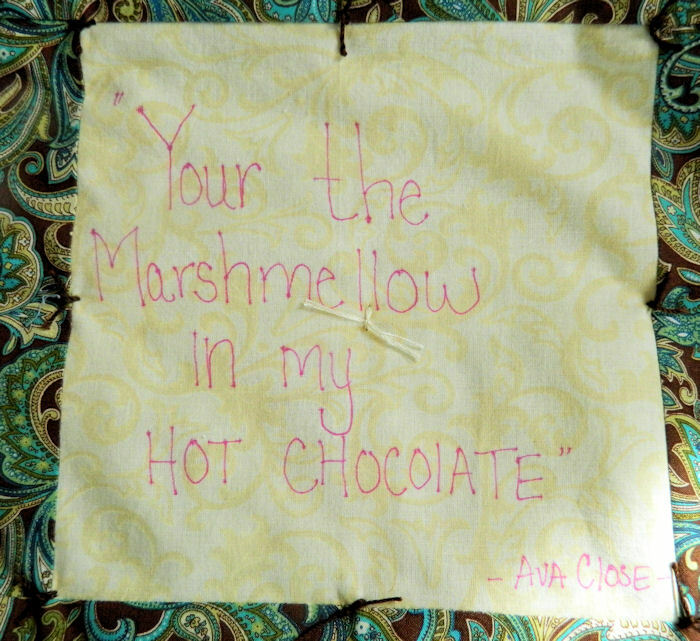 The samples should vary from the very simple “Congratulations from Uncle Bob and Aunt Susie” to fun drawings and quotations, demonstrating that everyone can participate at their own comfort (and skill!) level. The sign briefly explains the objective and instructs them to leave a 1/2″ margin for a seam allowance. Provide a couple of Bibles for people who wish to look up scriptures, but the table should be small enough to make them realize that they are to take the squares to their seats and not stop at the door. This is a good icebreaker for guests who may not know each other well. It provides a natural topic of conversation, and watching others do it will encourage those who might not otherwise complete a square. Even the children can participate! Let people work at their own pace, but try to get the completed squares and pens returned to the table before the food is served. The blocks can be assembled and finished as you like. 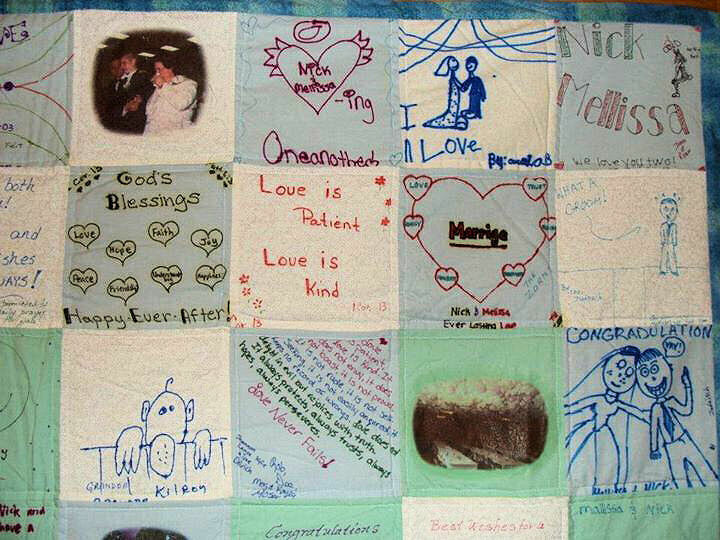 We machine-quilted the Wedding Day Quilt we made for a niece ten years ago, but we tied the one we just completed for my nephew, because it’s much larger and we didn’t have as much time. 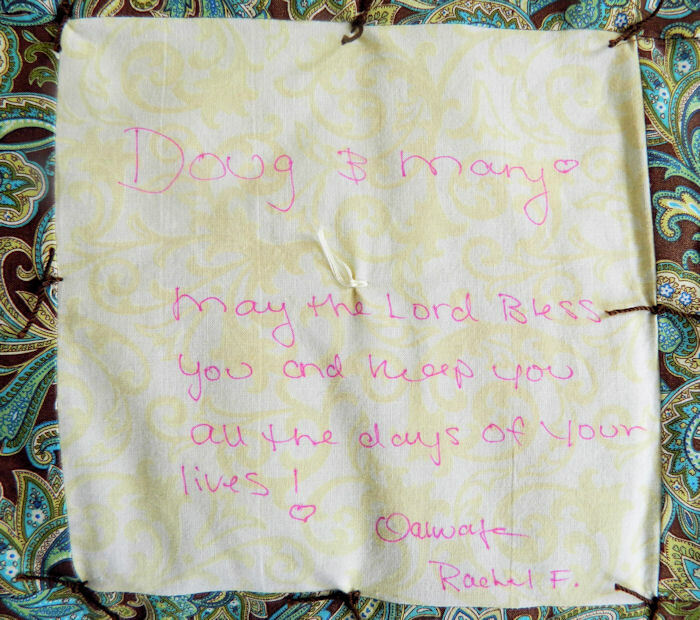 It’s a nice warm quilt, suitable for a twin sized bed or snuggling on the couch, a special reminder of their wedding day and the people who were there to celebrate with them.